For some people it is best to have more realistic expectations, while for others this often feels like holding themselves back. Not everyone feels like setting more practical guidelines for themselves, but for some people this helps them achieve their goals without fail. 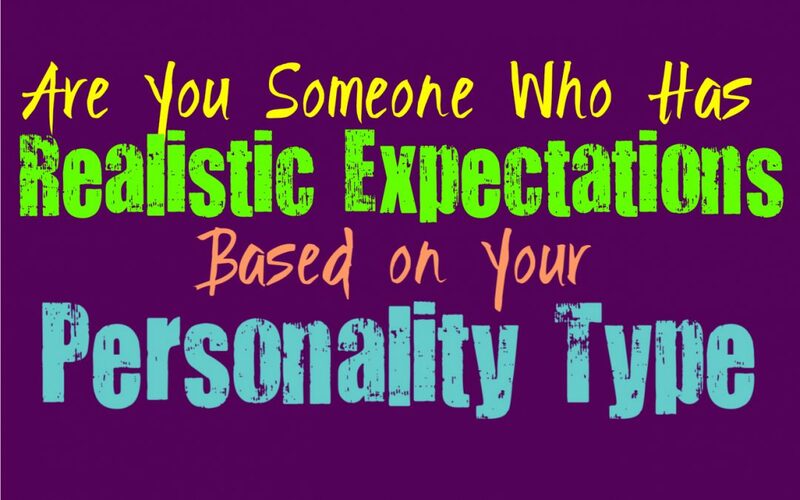 Here is how realistic your expectations are, based on your personality type. INFJs might appear more practical, but they often have somewhat high and even unrealistic expectations deep inside of them. They don’t necessarily share these goals and beliefs with others, but they possess such complex minds and hearts that it becomes difficult for others to really understand. They want to be able to achieve their goals and so they are often capable of working hard towards something that means a lot to them. At the same time INFJs sometimes have expectations for themselves which are a bit difficult to live up to. ENFJs definitely have intense expectations, especially for themselves. Sometimes the things they want to achieve or expect, can be a bit unrealistic, or at least it seems that way. Even though the ENFJ often has these rather lofty expectations, they are willing to work hard to achieve them. They don’t like believing in things that are too simple and easy to accomplish, so sometimes this can seem a bit unrealistic from outsiders. ENFJs are capable of people who will do whatever it takes to make things happen, and so what is unrealistic to others might be completely achievable to them. INFPs definitely aren’t ones to be considered realistic, but they are often perfectly accepting of this. They would often prefer to be unrealistic than boring or dreamless, since being someone who doesn’t imagine new possibilities feels completely stagnant to them. INFPs are willing to be considered unrealistic or even strange, as long as they are standing up for what they believe in with a sense of direction and morals. They are aware that sometimes their expectations or desires can seem unrealistic, but that doesn’t mean they are going to give up on them. ENFPs can sometimes hold unrealistic expectations, but being practical just isn’t the top of their priority list. They are capable of seeing things from a more practical point of view, but they don’t feel a need to follow this strictly. For the ENFP it feels stifling to constantly have to uphold a sense of realistic behavior and beliefs. They want to feel free to believe in anything they want, without having people tell them this just doesn’t make sense. The ENFP is led by their desire to explore the world with an open heart and an open mind. INTJs definitely don’t hold unrealistic expectations, instead they believe in being logical and practical with everything they do. They don’t like stepping into something without being prepared and knowing they can handle what is to come. For the INTJ it seems foolish to have expectations which are set higher than is achievable, since I will only lead to disappointment. They do work hard to achieve their goals and those goals are often truly high, but the INTJ knows they can achieve them if they push themselves and overcome their challenges. ENTJs definitely try to be realistic in most of the things they do, but that doesn’t mean their expectations aren’t very high. While ENTJs often hold expectations which are high, they are still achievable goals which the ENTJ will work hard to accomplish. They don’t believe it is wise to have these impractical expectations for life, since it can only lead to feeling disappointed and that is not something the ENTJ is searching for. They want to be able to accomplish anything they set their sights on, and so they want to be sure they are being realistic even if they have to work hard for what they want. INTPs do sometimes have these internal expectations which can seem a bit unrealistic and over the top. They simply don’t share these inner feelings and desires with others in most cases, since they don’t feel comfortable exposing themselves in this way. Most INTPs have certain dreams and even expectations, which are a bit difficult to really obtain. In most cases they try to analyze things and present themselves as logical. They won’t completely hold onto these expectations but sometimes they linger without the INTP being able to prevent. ENTPs don’t mind being seen as a bit unrealistic, since they want to be able to break barriers. For the ENTP it is important to think outside of the box and sometimes go after things which seem completely impractical. Their minds work differently than most people, which leads them into directions which might seem surprising. At their best the ENTP is both logical and even a bit unrealistic and impractical. This combination makes for something truly intriguing, causing the ENTP to uncover things that most people would never even consider. ISTJs are very practical people and so holding onto unrealistic expectations just isn’t them. They want to be sure they don’t get caught up in things that don’t make logical sense. For the ISTJ believing in these unrealistic expectations is only going to set themselves up for failure and that is not something they are okay with. They want to be sure they can accomplish what they want and won’t end up making too many mistakes along the way. ISTJs might have high expectations for themselves, but they work hard to be sure they can achieve them. ESTJs don’t believe in holding onto any unrealistic expectations, even though the ones they do believe in are rather high. They simply want to be sure the things they hold onto are realistic and can actually be accomplished. ESTJs do not accept failure from themselves or the people around them, and so they don’t like allowing themselves to make mistakes because they set their hopes too high. While ESTJs to hold themselves to high standards, they do this because they know the things they are aspiring to are completely possible. ISFJs try not to hold any unrealistic expectations, but sometimes they cannot help themselves. They have a goal of maintaining harmony and being able to keep peace with everyone in their lives, and this is certainly not the most realistic goal. They try to accomplish everything they set their minds to and want to be able to provide for the people they love. ISFJs expect a lot from themselves, and sometimes just the desire to be perfect is completely unrealistic. While ESFJs are seen as practical people, they can sometimes possess these expectations which can be a bit unrealistic. They aspire to accomplish so much for those they love, and sometimes this can set themselves up for failure. They want to be everything to everyone, and that is simply too much for anyone to handle. ESFJs might even have some hopes inside of them which are a bit unrealistic, but they try their best to keep these to themselves. ESFJs are practical people on the outside but often dreamers on the inside, which makes for trouble sometimes. ISTPs are actually rather realistic and practical people, and so they don’t like setting these unrealistic goals or expectations. While they might have a wild streak and desire to experience excitement, that doesn’t mean they aren’t realistic about it. ISTPs simply believe in doing what feels right for them, without needing to answer to other people. At the same time they don’t hold onto internal beliefs which are unrealistic, since they actually favor logic and reason. ESTPs try to be practical and reasonable people, and so they strive to let go of their more unrealistic expectations. At the same time there is a part of them which cannot seem to let go of the things they truly want. Even if something seems unrealistic to others, the ESTP might have a belief inside of them that they can achieve these goals and get what they want. They don’t give up on what matters to them, and so often what seems unrealistic to others is actually achievable to the ESTP. ISFPs can sometimes have unrealistic expectations or hopes, which they have a hard time letting go of. They are dreamers and sometimes this causes them to expect more from life and love than most people can really live up to. ISFPs don’t like settling for anything less than what they need and desire from life. When they truly want something, they will wait for it and continue searching until it feels right. ISFPs sometimes seem to have a bit of wanderlust, always wandering from one things to the next hoping to get what they want. ESFPs actually can hold onto expectations which are completely unrealistic, but this comes from a very honest and sincere place inside of them. ESFPs are hopeful people who believe in always maintaining a sense of positivity towards their lives. They want to follow their hearts and dreams, even if the things they are expecting from life can seem unrealistic to others. ESFPs aren’t likely to favor practicality over passion and heart, this just isn’t who they are.